Darkness. As far as you could see. The very definition of space. It’s hard enough to find this spot on purpose, much less by accident. The young pirate checked his chronometer, late. He was about to mumble something when the passive sensors picked up something coming into range. Pressing gently on the left pedal, he yawed, turning the active sensor cone towards the contact. The ship was beat to hell. The hull patched up more times than could be remembered. Rumors floated around that it was found drifting near Idris IV, which fueled further stories that it took part in the great battle. 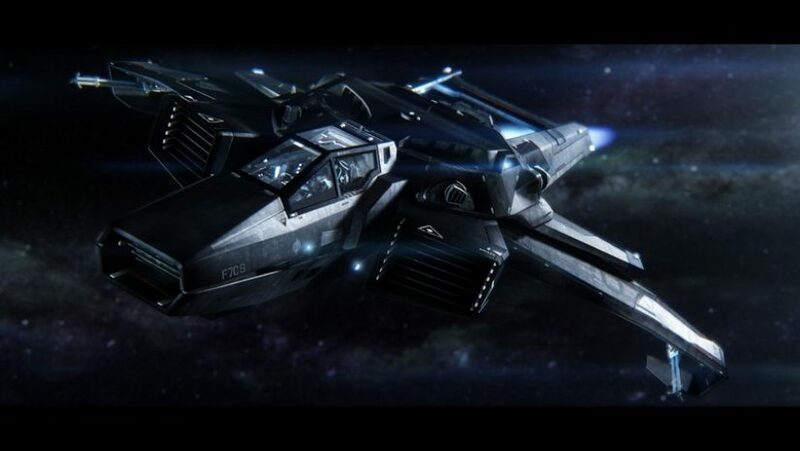 Anyone who knew anything about history knew that there weren’t any Idris Frigates back then. They got their name from the battle, not the other way around. It was a prize long treasured by its pirate captain. Who, if you’d have met him in a bar, would have told you he won it in a high stakes card game. The young pirate knew the truth. He didn’t bother contacting the larger ship. Like a mother to its young, the ship stopped and waited for the Ghost to approach. He maneuvered the ship into the front of the open hangar at the nose, realizing he had more room with half of each wing gone. The scrappers in the hangar looked up at the Ghost in awe. Not for its craftsmanship, or love of the starfighter, but the credits. The credits they knew they could get from it, not the whole thing. Just the parts. The young pirate knew this and saw them looking, a sinking feeling in his gut. The hangar deck was littered with hundreds if not thousands of parts, like children’s building blocks tossed on the floor. The scrappers, five in all, each had their own thing to take apart, and worked diligently. They already had a 325a resting on a bunch of old crate sized Stor-all containers, like a sea creature on blocks. Landing gear for the 300i series was the most profitable. The joke was that rich young OJ owners would snap them right off, trying to impress their friends with fancy manual landings. The truth was nobody knew exactly why, they just always fetched a good price. They already had one on a cargo pallet and were trying to fit it into the port cargo lift. The scrappers all looked up at him. An older one with a fried beard grimaced, “Too late young blood.” There was laughter from the others and the old scrapper slapped his cybernetic hand down on the stubby wing. The young pirate nodded, “Yea, Cap will hear….from me. Til then, no scrappin! Not one bolt til I talk to Cap, or it’s bye bye fingahs! Metal or otherwise!” The young pirate waved the pistol in his hand. The old scrapper muttered something and moved back towards the 325a, the rest falling into step behind him. Holstering his weapon, he let out a sigh. He took off his helmet and gloves, letting his hands feel the cool recycled air again. Tossing his gloves into the helmet and dropping it into the seat, he slid down the side ladder and made his way to the opposite side cargo lift, turning around to take a look at the Ghost sitting on the deck one last time before the door closed. He made his way to the captain’s quarters, moving through the starboard corridor. The path was the same as always, difficult. Most captains wouldn’t think or dare to fill every hallway and spare cubic centimeter of the ship’s interior with cargo,except this one. It was all scrap parts, each one hastily tied down not with mag loc deck plating like in the cargo bay, but simple cargo nets, and straps. You might find a class two weapon here or a size three shield generator there. No place was safe from the clutter. You may find yourself reading the warning label on a canister of ship fuel as you “drop the cargo off at the depot” if you understand my meaning. Then again most captains weren’t Osric. He understood that volume is what gets you the most credits, not weight. And his ship had volume to spare. The young pirate pressed the buzzer on the door and waited. He noticed a pair of Aurora VTOL fans leaning against the bulkhead next to the door. They weren’t there when he left. The door slid open and the young pirate stepped in. The captain’s quarters were immaculate, not standard. Pear colored ceiling, walls made out of sea shell tile, and marble floors. Not to mention old earth furniture, which was no doubt secretly bolted down. Probably the only place on the ship that didn’t hold some kind of scrap. “You were on the deck, boots off, you know the rules!” Captain Osric wore his white UEE navy inspired uniform. The gold buttons shined in the bright room. He was turned away and looking at his holo chart. The captain paused just long enough for the young pirate to try and speak, and then he proceeded to cut him off again. “Do you know what the most profitable part of a hornet is? I’ll give you a hint, its the only parts you didn’t bring back with you.” The captain raised his voice slightly, turning around he stroked the front of his white pearl prosthetic nose. “Cap,” The young pirate started but then couldn’t finish. The young pirate hated the fact that the captain never got angry, it was unnerving. He wished he could dump some kind of pitch liquid on his nice white outfit, make him lose his cool. The thought was distracting and his mind wandered momentarily, he caught the tail end of the captain’s speech as he came back to reality. The young pirate trudged across the hall to the crew quarters holding the credit chit in his hand. A little over nine thousand UEC. He’d rather have a ship of his own. The recycled air in the old ship was bitter, he missed the sweet clean air inside the Ghost. He was tired of the trash, the clutter, the smell, and the captain. Two toilets and two showers for a crew of twenty five or so, the rest were filled with…. scrap. The lukewarm shower was hardly a welcome feeling, going cold every 20 seconds or so. Leir, the young pirate thought, the Outsiders. They’d buy anything. Doesn’t matter if it’s stolen or not. Dammit, it could’ve been mine. The young pirate drifted off into a troubled sleep. The captain waved his hands at it like a magic trick. He turned to the old scrapper, “Why are you still standing there, get to work.” The old scrapper saluted with his cybernetic hand, “Aye sir.” The light from the cutters flashed on the captain’s face. He mulled over sales pitches in his head, words like ‘Unique!’, ‘One of a kind!’, and ‘I’m a genius’ came to mind.